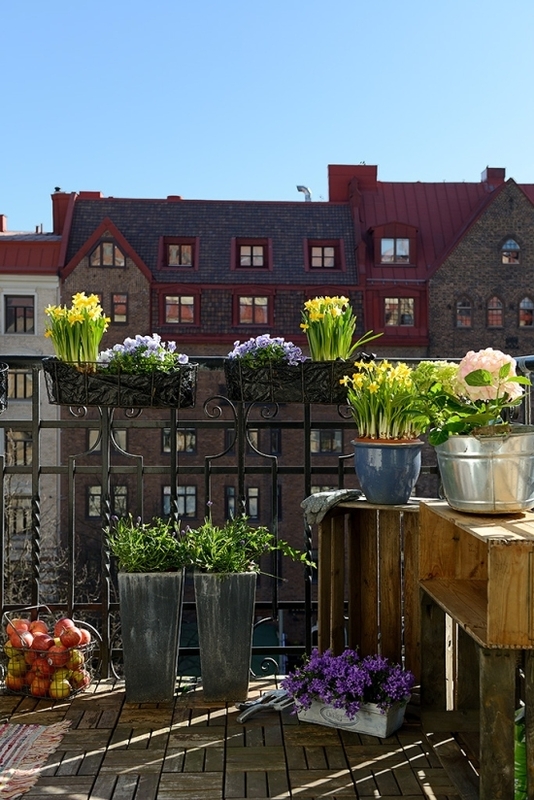 This Scandinavian apartment is adorable. In the living room, a comfy white sofa is framed by a fabulous photograph, and a large window provides a significant amount of natural light. On the sofa, black and white patterned pillows fill the space, adding a dose of coziness. Next to the sofa, a chair with a throw and a colorful pillow, sits. The dark hardwoods contrast the bright white room and anchor the outstanding interior design. 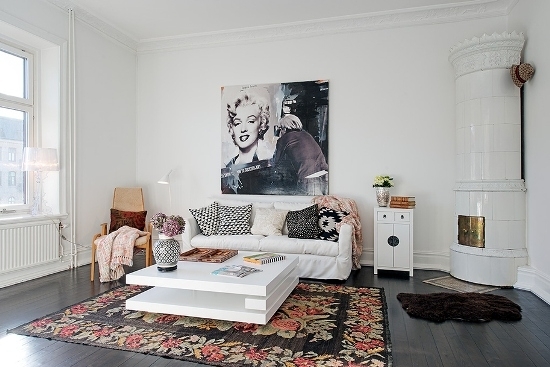 The floral rug is perfect, bringing a bit of color and more interest to the room. 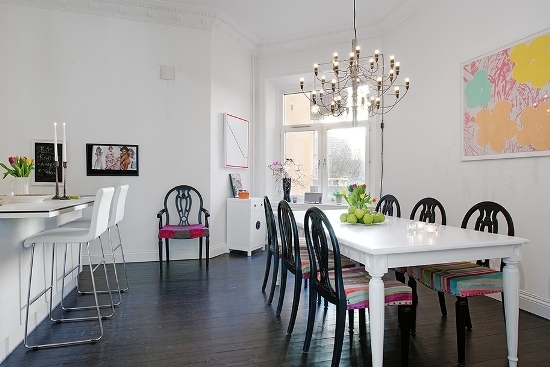 A modern white table sits on the rug, and a white cabinet sits on the other side of the sofa. The fireplace in this room is delightful with its white exterior and gold doors: charming and elegant. We love the striped walls in this Scandinavian apartment. They bring a little variety to the white color scheme. 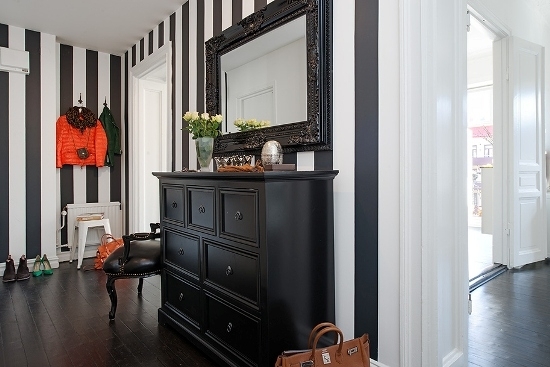 The black ornate mirror and the black dresser are lovely. Light browns take over in the bedroom. We love the plaid and the stripes, and the addition of the plush dark brown pillow. The dark hardwoods and the white walls continue, and simple lights wonderfully frame the bed. Large windows illuminate the room, and modern white cabinets sit next to the patio doors. Above the cabinets, a white artwork decorates the space. We adore the outdoor access in this room, and the continuation of the mostly white theme. It really allows the light brown to shine, effectively creating a cozy atmosphere. The dining room in this Scandinavian apartment is full of cheer and playfulness with its bright colors. A lengthy white table is surrounded by black chairs with gorgeous patterns. Bright floral artwork adds a dose of merriment, and a gorgeous chandelier adds a touch of glamour: simply beautiful. What’s your favorite thing about this Scandinavian apartment?